The Amano Group places "environmental management" as one of the important task issues in its management policy and all employees are constantly striving hard to achieve environmental goals. In order to maximize our efforts and to realize continuous improvement, we are promoting environmental initiatives by exercising the PDCA cycle, which forms a part of the group's environmental management system, and this is done not only at production sites, but also in the R & D, distribution, business planning, and sales promotion divisions. Amano obtained the Environmental Management System international standard "ISO14001-1996" in August 1999 for its "Environmental management and operation for the design and production of industrial cleaners and dust collectors" at the Hosoe facility (Hamamatsu city, Shizuoka prefecture). In January 2000, the Tsukui facility (Sagamihara city, Kanagawa prefecture) obtained the same for its "Environmental management and operation for the production of Time Information Systems, Time Recorders, and Parking Systems". In April 2007, the former Toda Factory (Hamamatsu city, Shizuoka prefecture) and Environmental Technology Co., Ltd. (an Amano group company located on the same premises as the above factory) obtained ISO 14001-2004 certification for their design and production of metallic molds, research and development into clean system products, and consultation and measurement services regarding work environments. After the factory integration carried out in April 2014, the Hosoe and Sagamihara Factories obtained ISO 14001-2004 certification. Amano has established the "Environmental Management Committee" with the officer in charge of environmental management as the chairman. This committee is responsible for deciding and reviewing environmental measures and targets, and the overall environmental policies related to environmental activities. 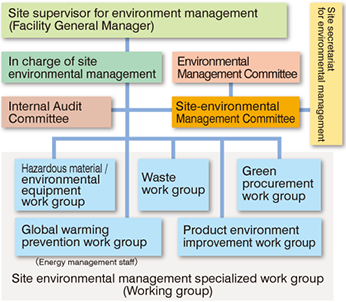 In addition, it appoints the Supervisor for environment management (facility General Manager) for each facility site whereby each facility will establish a Site-environmental Management Committee. The site committee will implement environmental protection activities particular to that site. The information related to the promotion of environmental management will be centralized at the Central Secretariat for Environmental Management through timely and mutual communication thereby sharing the most updated information. Amano has established 5 working groups at each facility (site) to identify specific issues, draft measures and its implementation plan, to validate the plan, and to give guidance for achieving the targets. Drafts implementation plans to avoid environmental pollution by hazardous materials. Validation of plans to avoid environmental pollution. Screening and approving the introduction of new chemicals. Screening and approving the introduction of new environmental equipment. Draft and validate implementation plans to reduce CO2 emissions and energy consumption. Give guidance to employees to practice energy conservation. Grasp the quantity of waste to promote waste reduction, sorting, and recycling. Draft implementation plans to promote reduction, sorting, and recycling of industrial waste. Validation of the drafted implementation plan. Give guidance to employees to practice appropriate waste processing. Draft specific plans to promote product recycling. Draft specific plans to promote product energy efficiency. Validation of recycling and energy efficient products. Deliberating the direction of green procurement. Draft specific plans to promote green procurement. Validation of the drafted implementation plan for green procurement. Give guidance to promote purchasing of materials and parts which used environment-conscious products. Promote green purchasing of fixtures and office supplies. The facility sites that have obtained the ISO14001 certification are subject to an annual internal audit. Environmental protection activities are checked to improve the level and performance of environmental management. In addition, internal auditors who have attended external education programs as part of their training are performing the environmental management reviews. Furthermore, Amano will receive objective evaluations by the certification authority when they review the sites periodically. The carrying of the "Environmental Policy"
The "Amano Corporation Environment Policy" is available to anybody at the company's website. It is also printed on Amano's pocket diary that is distributed to all employess and thereby carried at all times. Additionally, each facility site has established their own "Site-Environmental Policy". Based on its "Environment Policy", from research & development to production, sales and services, Amano Corporation will endeavor to achieve and maintain high environmental qualities across all levels of business activities. Amano will establish an environmental management system that will be continuously maintained and improved by restructuring its organization and operations to practice environment-conscious business activities. All employees of the Amano group will adhere to all environment related laws and regulations along with internal standards. Effective use of resources will be practiced by reducing, reusing and recycling. We will promote efficiency and rationalization at all levels of business activities, namely, production, sales and services. 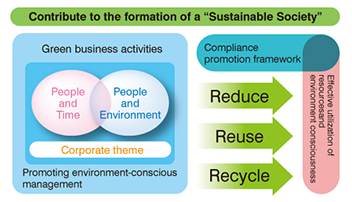 Amano will endeavor to develop and produce products, which are environmentally friendly to reduce environmental impact. All employees of the Amano group will be subject to environment education and will strive to raise environmental consciousness. All employees of the Amano group will be notified of this "Environment Policy", and will be made available on demand by the public.